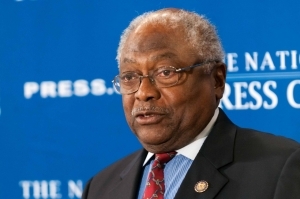 Rep. Jim Clyburn speaks at a Nov. 20 Club Newsmaker. Assistant Democratic Leader Jim Clyburn of South Carolina said the actions of Lincoln and Truman refuted arguments that Obama was acting “lawlessly” and “unconstitutionally” on immigration. Clyburn said that when Lincoln drew up the Emancipation Proclamation ending slavery and when Truman ordered and end to segregation in the armed services, these actions were also “beyond the law” at the time but were within the meaning and parameters of the Constitution. He said he hoped another government shutdown would not take place, though was concerned that House Republicans would again seek to impeach a Democratic president, as they did Bill Clinton. The 2014 election was like a “pendulum on the clock," he said. “The country moved right this year. I believe that if the voters intervene as I hope they will, then we will go back to the left in two years."